When we talk about anthropogenic climate change, we are generally thinking of the industrial era, which really got going when we started using fossil fuels (coal to begin with) to drive machinery and trains. That was around the middle of the 18th century. The issue with fossil fuels is that they involve burning carbon that was naturally stored in the crust over hundreds of millions of years as part of Earth’s process of counteracting the warming Sun. Some climate scientists argue that anthropogenic climate change actually goes back much further than the industrial era, and that humans began to impact the climate by clearing land to grow grains in Europe and the Middle East around 8,000 years BCE and by creating wetlands to grow rice in Asia around 5,000 years BCE. Clearing forests for crops is a type of climate-forcing because the CO2 storage capacity of the crops is generally lower than that of the trees they replace, and creating wetlands is a type of climate forcing because the anaerobic bacterial decay of organic matter within wetlands produces CH4. In fact, whether anthropogenic climate change started with the agricultural revolution or the industrial revolution is not important, because the really significant climate changes didn’t start until the early part of the 20th century, and although our activities are a major part of the problem, our increasing numbers are a big issue as well. Figure 19.9 shows the growth of the world population from around 5 million, when we first started growing crops, to about 18 million when wetland rice cultivation began, to over 800 million at the start of the industrial revolution, to over 7,300 million today. A big part of the incredible growth in our population is related to the availability of the cheap and abundant energy embodied in fossil fuels, which we use for transportation, heating and cooling, industry, and food production. It will be hard to support a population of this size without fossil fuels, but we have to find a way to do it. A rapidly rising population, the escalating level of industrialization and mechanization of our lives, and an increasing dependence on fossil fuels have driven the anthropogenic climate change of the past century. 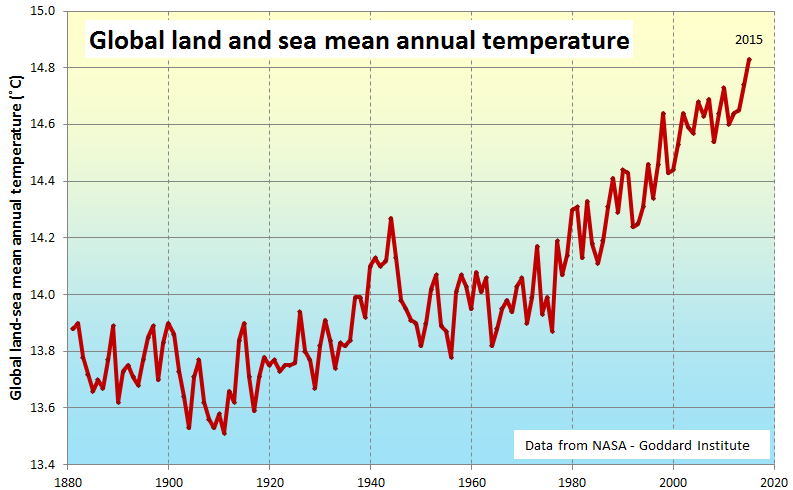 The trend of mean global temperatures since 1880 is shown in Figure 19.10. For approximately the past 55 years, the temperature has increased at a relatively steady and disturbingly rapid rate, especially compared to past changes. The average temperature now is approximately 0.8°C higher than before industrialization, and two-thirds of this warming has occurred since 1975. One of the driving factors of the recent increase in the rate of climate change has been the migration of North Americans from city centres to the suburbs, and the resulting need for virtually every household to own at least one car, when previously they were able to get around on foot or public transit. The Intergovernmental Panel on Climate Change (IPCC), established by the United Nations in 1988, is responsible for reviewing the scientific literature on climate change and issuing periodic reports on several topics, including the scientific basis for understanding climate change, our vulnerability to observed and predicted climate changes, and what we can do to limit climate change and minimize its impacts. 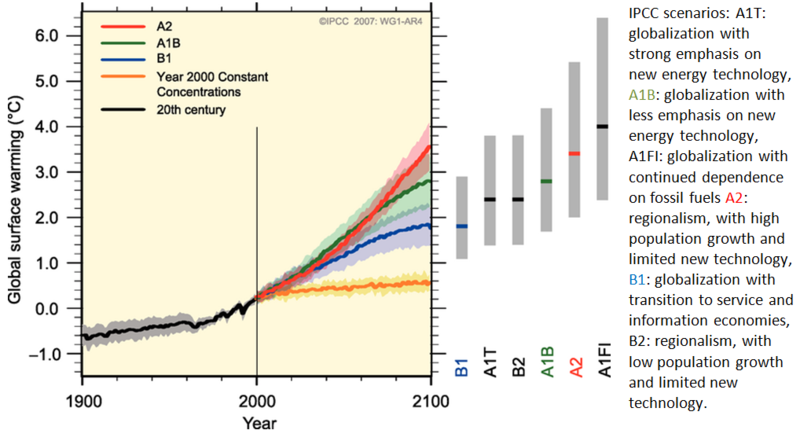 Figure 19.11, from the fifth report of the IPCC, issued in 2014, shows the relative contributions of various GHGs and other factors to current climate forcing, based on the changes from levels that existed in 1750. 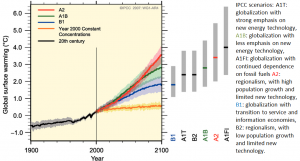 Figure 19.12 shows the IPCC’s projections for temperature increases over the next 100 years. The biggest anthropogenic contributor to warming is the emission of CO2, which accounts for 50% of positive forcing. CH4 and its atmospheric derivatives (CO2, H2O, and O3) account for 29%, and the halocarbon gases (mostly leaked from air-conditioning appliances) and nitrous oxide (N2O) (from burning fossils fuels) account for 5% each. Carbon monoxide (CO) (also produced by burning fossil fuels) accounts for 7%, and the volatile organic compounds other than methane (NMVOC) account for 3%. CO2 emissions come mostly from coal- and gas-fired power stations, motorized vehicles (cars, trucks, and aircraft), and industrial operations (e.g., smelting), and indirectly from forestry. CH4 emissions come from production of fossil fuels (escape from coal mining and from gas and oil production), livestock farming (mostly beef), landfills, and wetland rice farming. N2O and CO come mostly from the combustion of fossil fuels. In summary, close to 70% of our current GHG emissions come from fossil fuel production and use, while most of the rest comes from agriculture and landfills. Exercise 19.3 What Does Radiative Forcing Tell Us? 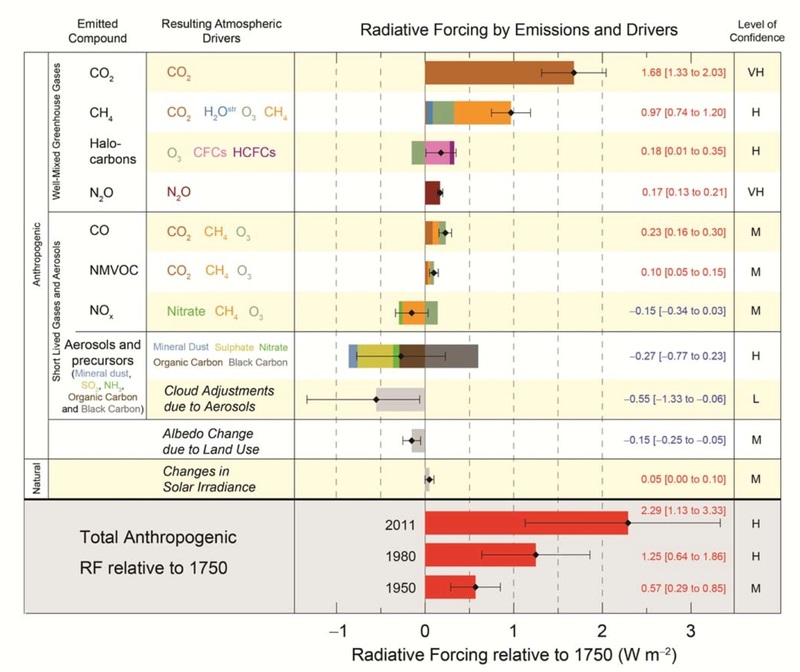 The bottom part of Figure 19.11 shows the total radiative forcing levels for 2011, 1980, and 1950, expressed relative to the forcing that existed in 1750. This forcing is measured in radiance at Earth’s surface in watts per square metre. For reference, the daily average irradiance for Earth is approximately 240 W/m2, so compared with 1750, we’ve increased that by 2.29 W/m2, or a little under 1%. ΔT = 0.8 * 2.29 = 1.8°C. 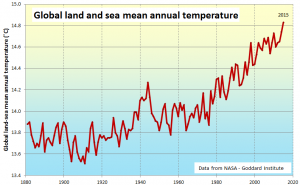 From Figure 19.10, you can see that the global temperature difference between 1880 and 2011 is 0.8 – (-0.6) = 1.4°C. The temperature change between 1750 and 1880 could have been close to 0.4°C, so that puts us in about the right range. Use the ΔT = ΔF * 0.8 equation to estimate the temperature differences for 1950 and 1980, and see how those compare with the actual temperatures from Figure 19.10. Previous: 19.1 What Makes the Climate Change? 19.2 Anthropogenic Climate Change by Steven Earle is licensed under a Creative Commons Attribution 4.0 International License, except where otherwise noted.